Starving orangutans might help to better understand obesity and eating disorders in humans ~ Health Matters Today! Rutgers Evolutionary Anthropologist Erin Vogel thinks new research published today in Biology Letters, a Journal of the Royal Society, examining how endangered Indonesian orangutans – considered a close relative to humans -- survive during times of extreme food scarcity might help scientists better understand eating disorders and obesity in humans. "There is such a large obesity epidemic today and yet we don't really understand the basis of the obesity condition or how these high-protein or low-protein diets work," said Vogel, whose research, Bornean orangutans on the brink of protein bankruptcy, represents the first time scientists have looked at how these long-haired, orange-colored apes -- that depend on low-protein fruit to survive -- endure protein cycling, or period bouts of protein deprivation. "I think studying the diets of some of our closest living relatives, the great apes; may help us understand issues with our own modern day diets," she said. According to Vogel, an assistant professor of anthropology in Department of Anthropology and Center for Human Evolutionary Studies, in the School of Arts and Sciences, the research shows that it is only during high periods of high caloric and protein intake that orangutans put on fat, a scientific fact that is sometimes ignored by those who believe that high protein, low carbohydrate diets are the best way to lose weight. She said it is only when caloric intake is restricted that orangutans use these fat reserves for energy and eventually dip into their protein (muscle) reserves – a condition that is seen with eating disorders like anorexia. "We discovered through this research that the daily amount of protein the orangutans take in when fruit is not available is inadequate for humans and one-tenth of the intake of mountain gorillas. But it is sufficient to avert a severe protein deficit," said Vogel. The Bornean orangutan population has fallen drastically in the last 50 years in Indonesia to less than 55,000 and on the island of Sumatra to less than 5,000 due to a massive amount of illegal logging and further clearing of the land to develop palm oil plantations in their now impoverished rainforest habitat. 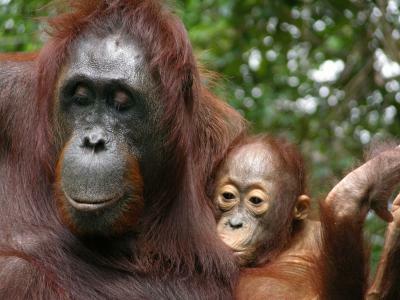 Vogel says that although some palm oil companies argue that clearing partially logged areas of the rainforest for palm oil plantations is not detrimental to the existence of the orangutan because their natural habitat has already been taken away, this research on protein cycling indicates that even areas that have been partially stripped of trees are better for orangutan survival than no forest area at all.